All computers have one thing in common – they often break down in the most unexpected moments, exactly when they are needed the most. And this doesn’t only apply to company computers, which sometimes have to be accessed 24/7. Nowadays, even personal computers are of utmost importance for many people – professionals need their laptops to make a living and home PCs are as important (or even more) as TVs. That’s why, finding a good computer repair Murrieta, when your computer breaks down, is critical. But which company to choose and what to look at? When selecting the right computer service, customers often stumble upon an issue of what kind of company should they choose – a small, local computer service that takes care of clients from the area around or should they pick a branded franchise? The answer to this question is easy – it depends on whether you want your PC to be taken care of by professionals with a passion or not. Computer services that require a brand of a big corporation to thrive don’t employ the best specialists and don’t really treat every client as a unique one. Customers come and go, and there’s no bond between the two. An exact opposite to that are (not all but most of them) local services, run by passionate professionals, who value customers, their time, and their hardware. 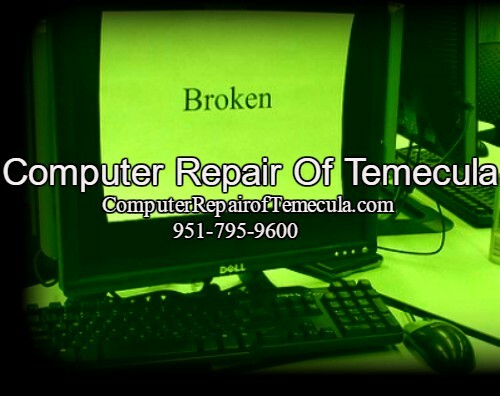 A great example of such company is Computer Repair of Temecula. To check the full offer of the mentioned company, visit ComputerRepairofTemecula.com. Their offer includes taking care of Laptops, iMacs, MacBooks and Desktops – you can call them any time you need computer repair Murrieta. Thanks to the lack of complicated corporate procedures, you can get a specialist at your house (that’s right – they will come to you) quickly enough to stay calm during the time in which you can’t access your PC. And it doesn’t matter whether you are a residential or an office client, as services for both are offered at your place unless your computer requires a bit more work. Should that be the case, it will be taken away by a technician and repaired overnight. And the best is, even if it has to be taken away, you only pay for 3 hours of service. A high-quality doesn’t come out of nowhere. It requires passion, a lot of technical knowledge and understanding of the client and his needs. This allows Computer repair of Temecula to give its clients the highest-quality services, personalized to meet the exact needs of each and every client. And, thanks to the lack of franchise cut, unnecessary corporate expenses and huge marketing budget (word of mouth that’s freely circulating among satisfied clients and their friends is responsible for a lot of business), it’s the most affordable computer repair Murrieta service around. If your computer just broke down, is working really slow or has any other problem, don’t hesitate. Visit ComputerRepairofTemecula.com and contact them ASAP to schedule an appointment with a technician. The company is ready to help you with a huge variety of services that they offer; all of them are available on the website. Leave it to professionals, don’t let fancy corporate ads and banners mislead you.